As the generic foundations of the BPM concept have already been explained, here we would like to present one of the leading BPM products. Metastorm BPM brings all the typical functionality of a BPM platform. Below you will find its full technical specification. Metastorm BPM is a Business Process Management (BPM) systems platform for automating people-intensive administrative and management processes. It is a flexible production-strength BPM system, supporting a very large number of processes, users, and transactions. It can access data from any ODBC data source, make use of external forms, integrate at an API level with a number of document management systems, and exchange mail with most email clients. More importantly it can easily integrate all these systems via one simple user interface, then present that interface to the user in the two most popular Windows clients, Internet Explorer and MS Outlook. Metastorm BPM architecture is shown in the chart below. The engine runs on a Windows Server platform, and requires either SQL Server or Oracle as an underlying database. Typically, one engine can handle around 5 user steps per second (125,000 steps in prime shift); multiple engines can run against one control database for high volume applications. The web server is normally Microsoft IIS; multiple IIS servers are also fully supported. Metastorm BPM forms are true thin forms, so highly suitable for Internet operation. They are created once in the designer and automatically rendered for the client in use. The workflow server (engine) runs on Windows 2003, makes use of MTS and communicates with clients via either DCOM or TCP/IP. It uses IIS as its web server and supports Microsoft SQL Server or Oracle as its underlying databases via ODBC. It communicates with 3rd party applications via DCOM, BizTalk or databases. With all workflow packages a key element is the method you use to design the workflow procedures. Metastorm BPM is one of the most fully featured, easy-to-use designers on the market today. You define your procedures by visualising them as a graphical map, then adding the detail behind each stage and action using a wizard. Metastorm BPM forms are created using the designer. Forms are re-usable across steps and processes. Once designed, a Metastorm BPM form can be displayed through any client (Outlook, Explorer or GroupWise). You can mix and match clients and the form has only to be built once. For flexibility, external forms can also be used, and intermixed with Metastorm BPM forms in one process, and linked directly to the Metastorm BPM engine. Additional controls and validations are available through server-side or client-side scripts. Metastorm BPM integrates seemlessly with Explorer, Outlook and GroupWise. All clients offer as default a to-do list (Inbox), a ’New Forms’ list (new processes available to the user) and a Watch list (personalised monitoring of system activity and workload). The Watch List allows managers etc to continuously monitor events in their business units and to intervene when necessary in any process, at any time. With the explorer client, anyone with web access can take part in a Metastorm BPM process (internet and intranet). The Explorer client presents these within an Outlook folder. Notification of new work can be delivered to the Outlook inbox if required. Metastorm BPM can access data from any ODBC data source, make use of external forms, integrate at an API level with a number of document management systems (including I-Manage and DocsFusion), and exchange mail with SMTP or MAPI email clients including Microsoft Exchange. Metastorm BPM supports XML. This is available for advanced use of Metastorm BPM components, for example calling Metastorm BPM services from within other applications, and building bespoke clients. Extensive sample code is provided. Metastorm BPM is made up of several modules. For more details please see the Metastorm website. 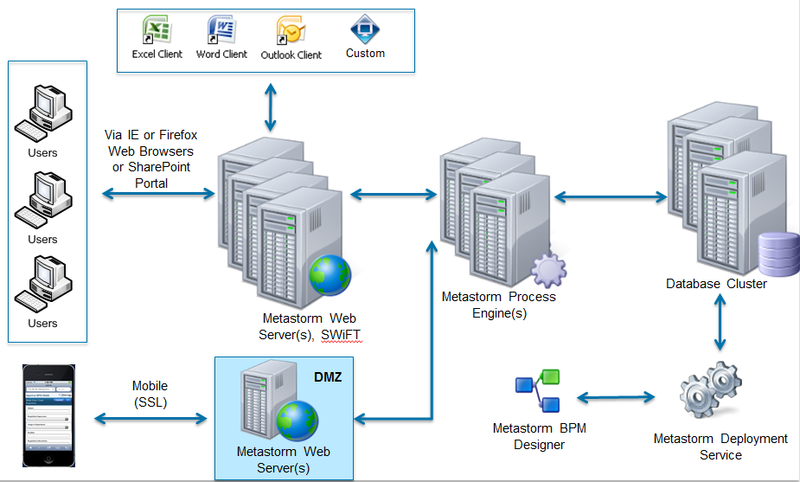 The Metastorm BPM server pack is the initial building block for any Metastorm BPM system. It includes one license for Metastorm BPM Designer, engine, users and roles, administrator, and server extensions for IE. A Metastorm BPM user license is required for any person who wishes to connect to Metastorm BPM and participate in Metastorm BPM processes. Metastorm supplies extensions to provide client services to an Internet Explorer browser, Microsoft Outlook 2003 and Novell GroupWise Version 5.5. The Metastorm BPM SDK provides the facilities for developers to provide Metastorm BPM client services in other clients. A user license is required no matter what client software is used. The Metastorm BPM public web access allows unregistered users to initiate new items in a process without having to sign on to the Metastorm BPM system. It is typically used by organizations to allow potential customers to indicate interest in or request further information about a product or service. The integration modules allow directories to be used as a single point of administration for the maintenance of Metastorm BPM users and the roles they hold.